BWW Media Group is committed to supporting the technologists and business users in the SharePoint and Office 365 community by expanding the richness and volume of training opportunities and community events. 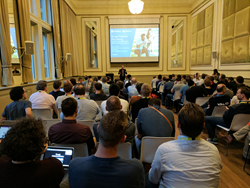 BWW Media Group announces that Europe’s premier SharePoint conference, SharePoint Unite (formerly called Unity Connect), returns to the Netherlands for its 8th annual conference 24-26 October 2017 at the Philharmonie Haarlem. To best address the growing needs of the enterprise collaboration community, UnityConnect is offering 2 distinct conferences this year – SharePoint Unite and Office 365 Engage. SharePoint Unite delivers keynotes, sessions, workshops, and panels that teach SharePoint professionals how to better leverage SharePoint for their businesses. At SharePoint Unite’s unique conference experience, delegates will enjoy syncing with experts, their peers, and solution and service providers. Topics covered at the event include SharePoint administration, development, and business strategies for on-premises, hybrid, and cloud implementations. Sponsorship opportunities provide engagement with tech professionals who are looking for SharePoint-specific solutions that can immediately address their business needs. “BWW Media Group is committed to supporting the technologists and business users in the SharePoint and Office 365 community by expanding the richness and volume of training opportunities and community events,” says George Coll, CEO and Managing Partner of BWW Media Group. To learn more about SharePoint Unite, please visit SharePointUnite.com. BWW Media Group is a privately held media company with offices in New York, Chicago, and Ft. Collins, CO. Led by CEO and Managing Partner George A. Coll, BWW Media Group is committed to providing the best content and community resources to help IT professionals and tech enthusiasts get the most out of their technology investments.